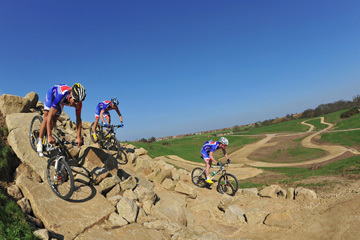 The Essex venue of Hadleigh Farm was chosen for mountain biking after the initial proposed site, Weald Country Park, was deemed insufficient by the International Cycling Union. 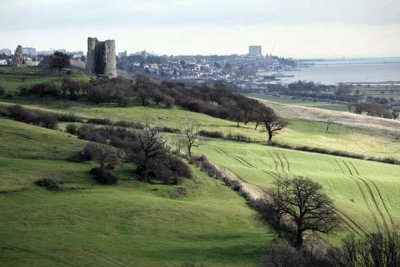 With stunning views for spectators and challenging gradients for mountain bikers, it is also set against the ruins of the 700 year old Hadleigh Castle. The thirteenth century castle was built in part to help protect England from an invasion by France, and was situated on a hill so that French ships could be spotted before they arrived. A park sprang up around the castle in the years following its construction, and it also contains ruins from the Iron age and the years following the Roman invasion. The course will be removed after the Games, for which up to 20,000 spectators will be able to watch the mountain biking each day. Mountain biking at the Olympic Games will take place over the course of two days, with 50 men and 30 women competing for medals. The mountain bike course at Hadleigh Farm was completed in March 2011, and provides a technically challenging course for competitors at a site owned by the Salvation Army. Some of the more challenges points of the course include the zig zag climb, oak tree drop and various rock formations. The terrain surrounding the track is covered by a low shrubbery, and the course winds through a sequence of woods and parkland.